Hiring someone who is not qualified for a financial position can lead to unexpected expenses and additional hiring cycles. Poor hiring decisions could also damage your reputation. It is imperative to select trustworthy, capable candidates to represent your business. To help, we offer Custom Background Checks that can be tailored to suit any position. You can save them for future use to reduce your hiring risks. It's not always easy to find suitable candidates. When you hire a qualified individual, it is important to ensure they remain eligible for employment. In addition to thoroughly screening new applicants, we recommend annual screenings for current employees. Annual reports show you if someone on your staff has something new on their record, such as a criminal charge or credit-related issue. You can also request recurring Motor Vehicle Record Search for people who drive on the job or provide transportation to clients. Are Your Employees Qualified To Handle Finances? Your employees represent your brand. You rely on their skills, expertise and knowledge of the financial industry. A Pre-Employment (PEER) Credit Report is an invaluable tool when screening your candidates. PEER reports show you an individual's credit history, payment patterns, credit lines, bankruptcies and other relevant facts. They help you confirm that the person is responsible with their own finances before granting them access to your company's or client's assets. The financial industry must adhere to numerous regulations, some of which impact hiring and screening practices. It is critically important to remain compliant with these laws. Establishing and maintaining a set of guidelines is a great way to plan ahead and protect your business. People who work in financial positions may be required to have certain levels of education, licenses or other credentials. Backgrounds Online offers verification services that show you whether or not a candidate has all of the necessary qualifications. We are FCRA certified and NAPBS accredited, so you can rest assured that we provide fully compliant and industry appropriate background checks to help you make educated hiring choices. Competition in the financial industry is fierce. How can Backgrounds Online help my company hire qualified candidates? A: When you're competing for the best candidates, it helps to move quickly. 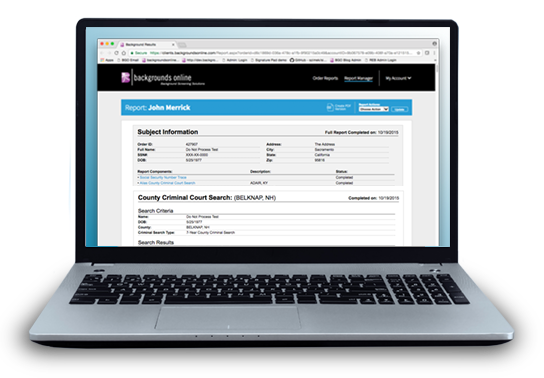 Backgrounds Online provides fast, authoritative screening services. We have a dedicated team that is trained on the best and most efficient ways to check references, verify employment and request court records. We build comprehensive, FCRA compliant reports that only contain legally reportable information. Use these reports to identify the best candidates so you can extend offers when ready. What do I need to know about PEER credit reports? A: Pre-employment (PEER) credit reports show details about an applicant's credit history, such as their status with current and previous creditors, payment patterns, bankruptcies and civil judgments. These reports are particularly important for Bank Tellers, Financial Advisors and anyone who will handle or oversee financial transactions. You must get permission from a candidate to run a Employment Credit Report. Learn more about the report and the requirements to obtain a report. How can I be certain that an applicant has the right credentials? A: Backgrounds Online offers verification services. Our screeners confirm professional licenses, certifications and credentials to ensure that your candidates are properly qualified for a specific job. Once confirmed, we provide additional information including the license issue date, expiration date, validity status and any record of disciplinary action. Are annual screenings worthwhile for financial employees? A: Yes. Screening your employees each year provides an assortment of benefits. You'll see if someone on your staff incurred a misdemeanor, felony, traffic violation or anything else that could be detrimental to the business. When you screen existing employees, Backgrounds Online provides them with a copy of their rights under the FCRA and all applicable documentation. If you have questions about how to screen existing employees, contact us today. A: Yes. Backgrounds Online partnered with Quest Diagnostics to provide drug screening services. If you wish to have your employees checked annually, we can arrange either a 5, 10 or 14 panel screening each year. Employees must authorize the drug screening in advance. Quest Diagnostics has facilities throughout the U.S., so we will assist in finding the closest location for your employees. A: We recommend background checks for every type of employee. These reports confirm the applicant's identity and check for relevant criminal records. You can use background checks to help identify the most qualified candidates for any position. To best serve the financial industry, Backgrounds Online recommends a custom package screening package.